Runners and spectators gather after the 5K to watch the awards ceremony on Saturday morning. 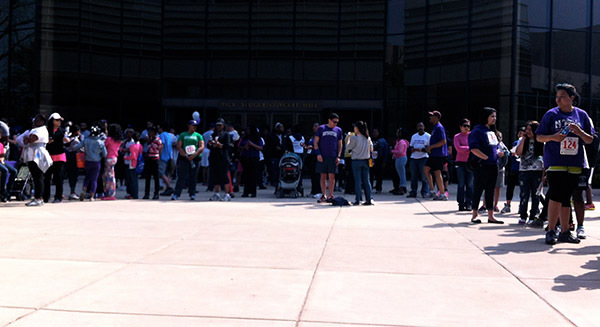 The NU 5K Walk/Run, co-sponsored by the NU Black Alumni Association, raised money for scholarships for African-American students at Northwestern. The Northwestern University Black Alumni Association’s Race for Diversity on Saturday helped the organization raise $50,000 for a scholarship that will be endowed by NU for the first time this year. The annual NUBAA 5K walk/run, the organization’s largest fundraiser of the year, had its eighth run on the Lakefill. The scholarship will be divided next year among incoming black students who demonstrate financial need. About 200 people participated in the race, Hancock said. Younger participants ran in a “fun run” separate from the 5K, but everyone prepared for the events together. Monica Lewers (Weinberg ’89), a personal trainer and fitness consultant, led stretches and other warm-up activities. Weinberg freshman Karley Woods was the first runner in the female category to cross the finish line. Graduate student Guillermo Munoz (Bienen ’12) came in first in the male category, finishing in an impressive time of 16:56 for the 5K. He said he raced Saturday because he could have fun and contribute to an important cause at the same time.